Award-winning filmmaker Gary Sinyor makes his playwright debut with a world premiere of his new comedy NotMoses, a hilariously fresh take on the Ancient Egyptian tale of Moses. Opening at the Arts Theatre on March 10th, NotMoses will enjoy a ten week run. Directed and written by Sinyor, who is known for his critically acclaimed film Leon The Pig Farmer, NotMoses is his first venture into the theatre. Set in Ancient Egypt, NotMoses tells the story of a crying baby who is pulled from the Nile by a Princess, only to be cast back in again when she sees Moses. NotMoses grows up to become a slave, whilst Prince Moses studies accountancy at Pharaoh’s Court. Soon, both are forced to flee into the Sinai desert and make kebabs on the burning bush. When the Good Lord orders them to lead the Jews into safety, a mysterious Miriam steps in. Sinyor has extensive film credits, including United We Fall with Jack Donnelly, The Bachelor with Renee Zellweger and Stiff Upper Lips amongst many others. After graduating from the National Film and Television School with a BAFTA nomination under his belt for The Unkindest Cut, Sinyor was commissioned by Eric Idle to write Leon the Pig Farmer, earning him the Evening Standard Award for Best Newcomer. NotMoses features unknown children Izzy Lee and Theo Mackenzie as the Son of God, after Sinyor plucked them from a batch of open auditions. The production is designed by Carla Goodman, with lighting by Humphrey McDermott. NotMoses promises to be an entirely wacky experience, with all ten plagues experienced in one evening (even if they happen to be offstage!) 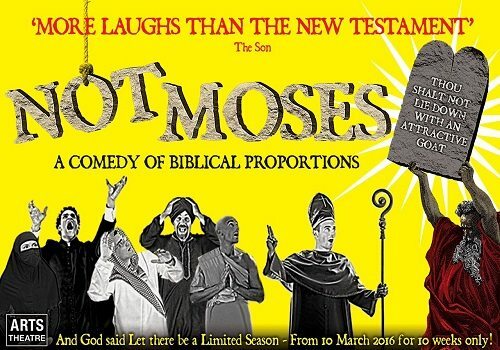 Catch the terrifically irreverent comedy NotMoses at the Arts Theatre from March 10th, booking until May 14th 2016.